Trevor Pateman's Philately Blog: What Can We Learn from Philatelic Covers? They are horrible aren't they? Petrograd March 1918. People are cold, hungry and in some cases frightened. But philately goes on. This collector has sent himself - his name and address is also on the back - these ugly, messy but quite expensive covers. What did he think he was doing? He has picked four kinds of stamp to decorate the envelopes - and probably he sent himself more. Fourth, varieties on the 10 kopeck perforated Arms stamp: there are two examples of misperforations and two examples of offsets [ Abklatsch], the stamps being stuck to the cover face down so that you can see the offset. Foolishly, the collector has put the stamps very close together and even overlapping so it's not possible to remove stamps one by one by cutting them out - something you could do when you realised the covers are a disaster. A couple of stamps have in fact been peeled off one cover. Second, that these covers show what this [ordinary ?] collector could obtain and what he thought more important to have used on cover than as mint stamps. The choice of Currency Stamps is easy to understand; the regular imperforates less so since the values shown here were freely available. Third, this collector did NOT have the following imperforates: 4, 10,20,25,35, 50,70 kopeck [ ignore the higher values as too expensive for him ]. Now this is really interesting because these are values which either cannot be found AT ALL in Petrograd at this period [ say March 1917 - March 1918 ] or which are rarities used in Petrograd. 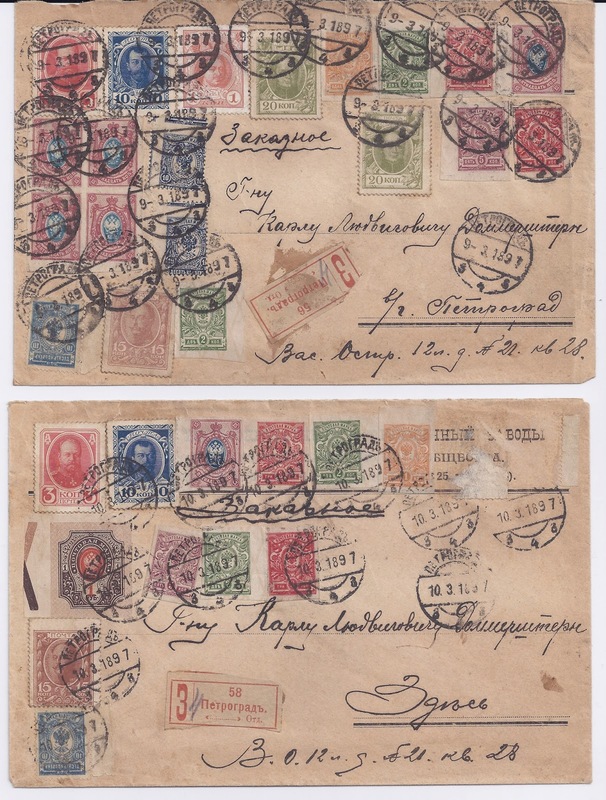 I checked my own collection: I have one loose 4 kopeck cancelled PETROGRAD 30 3 18 and a block of 70 kopeck cancelled PETROGRAD 11 6 19. That's it for the values missing from these philatelic covers. So my guess is that these imperforate values (except perhaps for the 4 kopeck) had not been distributed to Petrograd post offices at this time ( March 1917 - March 1918), or not distributed in significant quantities. And they were perhaps available to some philatelists with privileged access since at least some of the values I have listed had been printed in Petrograd in the period in question.